Wine aficionados say that drinking wine involves far more than a simple evaluation of taste. Aroma, temperature and a lovely bottle can all factor into our experience of, say, a Bordeaux. But, what if outside factors like a wine’s color, or even the lighting in the room we drink it in, can actually change how we perceive the flavor? David Munksgard, a winemaker at Iron Horse Vineyards in Sonoma, California, says he uses a bit of red wine in some of his sparkling blends to hint at what the bubbly might taste like — before patrons ever take a sip. Charles Spence agrees that color and other sensory phenomena can prime our brains for flavor, setting expectations about the taste that anchor our experiences when we’re actually eating and drinking. Spence leads the Crossmodal Research Laboratory at the University of Oxford and has studied the effects of “mood lighting” on our perception of a wine’s taste. He says that our tendency to color-categorize flavors may have evolved to help us judge our food for both ripeness and toxicity. To test the influence of color on a wine’s taste, Spence and his team ran an experiment in 2014 in which they gave over 3,000 Londoners red wine in black tasting glasses, obscuring the beverage’s color. They then asked people to sip the same drink under white, red and green lights and rate how they thought it tasted each time. “What we were able to show with these 3,000 regular drinkers — not wine experts or such — is that we get about a 15 to 20 percent change in people’s perception of the fruitiness or freshness of the wine, how much they liked it, simply as a function of the background illumination in the room in which they were tasting,” Spence says. For example, Spence says that even when we can’t see into our wine glasses, a red-lit room can nonetheless prepare our brains to expect sweetness. What about when you (or a waiter) set the wine bottle on the table, perhaps with a satisfying thud? Spence says that too is a game of the senses, to a point. Ultimately, though, you can’t put lipstick on a pig — or pass cheap wine off as finer stuff in a heavy, stoppered bottle. IRA FLATOW: This is “Science Friday.” I’m Ira Flatow. As you may know, if you’re a regular listener to the show, we’re celebrating Science Friday’s 25th birthday this year. And in fact it was 25, years ago this week that we got our staff together and started to make the program, Science Friday. As part of that anniversary celebration, last month I took a trip to the Iron Horse Vineyards in Sonoma, California, where my mission– it’s a tough one– was to taste eight different blends of the same sparkling wine and pick my favorite for a special Sci Fri bottling. Here’s a little taste of our visit to Iron Horse vineyards with David Munksgard and Joy Sterling. DAVID MUNKSGARD: Science is very important in wine making, but most important is the craft of wine making, and that’s something that you only learn by doing or by observing, and certainly working with somebody that’s done it for a number of years. IRA FLATOW: How long have you been doing this? DAVID MUNKSGARD: I believe it’s 36 years, 20 years here at Iron Horse. Yeah, you lose count after a while. My name is David Munksgard. I’m the wine maker at Iron Horse Vineyards, that is my lucky task in life. And we’re standing in the middle of one of our most beautiful pinot noir vineyards, and this will be used for making a beautiful red table wine. IRA FLATOW: A giant funnel. DAVID MUNKSGARD: Like a giant funnel, so that all these bins of grapes will be funneled through that. You ought to pop one in your mouth. IRA FLATOW: It doesn’t taste like Concord grapes, that you expect, or like you would get in the store. It’s very sweet. DAVID MUNKSGARD: It is sweet, yet it has a nice, bracing acidity that gives it a cleansing on the palate, as well. And it’s just plain yummy. Inside this room is where we do the final steps in the sparkling wine making production. Bottling is relatively simple. We’ll have the wine, we’ll have extra yeast, and we’ll have extra sugar. And we’re expecting that fermentation all take place inside the confines of a champagne bottle. JOY STERLING: OK, so now we’re going to go down and taste. DAVID MUNKSGARD: We are. We can’t put this off any longer. JOY STERLING: Do you want me to help pour? So if you look down at your sheet, wine number 1 is the 2012 Blanc de Noir cuvee that we have added in that case eight mL of blanc de blanc lex, 4 mL leaders of a brightly colored red wine. We also added on the next wine some pinot noir. So each glass has some variations in these different items that we’re going to be adding. Do you follow that? IRA FLATOW: So the same three items, but just in different proportions. DAVID MUNKSGARD: That’s right. Yeah. So now what we need to do is just simply get to business. IRA FLATOW: All right, wine number 1. Tastes good. 1 is a little stronger than 2. 3 is good, too. This is a tough business. By the time I get to 4, I may not care. Did you purposely add that color effect to influence the outcome? DAVID MUNKSGARD: Sure. It sets the stage. If this was in a dark glass and you couldn’t see, your brain wouldn’t be working on that. You would just simply go on what it smells like, and then what it tastes like. But you can’t help it as a human being to start thinking about what that wine is going to smell and then taste like. All right, have you come up with something? IRA FLATOW: Judging the different glasses here, what my final judge was the flavor, but it was also which one would I like to have more of. And that’s the one I wound up picking, which was the number 7 on our list. DAVID MUNKSGARD: Starting with wine number 1, going on through wine number 8, I was giving you variations on a similar theme. And I think we’ve chosen a wine that will fit beautifully with fall foods, and the whole fall experience. JOY STERLING: We should cheers to that. Cheers to that! I finished mine. IRA FLATOW: Yeah, and I finished mine, too, and all eight– almost through eight of those glasses. Somebody had to do it, right? Well, it really was a true test of senses, let me tell you. And as you heard, lots of sensory factors, like the color, can influence the choice of wine. Color can influence our sense of smell and taste, and subtle changes in environment, with the glassware itself, might make all the difference between liking or disliking a glass of wine. And now that we have whet your palate a bit, let’s talk about some of those sensory phenomena that can occur when sipping wine with Charles Spence. He’s a professor of experimental psychology, University of Oxford in the UK, and head of the Crossmodal Research Laboratory there. Welcome to Science Friday. IRA FLATOW: You’re welcome. Dr. Spence, in that piece that we heard, the wine maker was talking about adding a little bit of red wine to his sparkling wines, to give it that pink blush color. Does that really change your brain? Does it prime it? CHARLES SPENCE: It most certainly does. I guess whenever, in everyday drinking and tasting, we’re always going to see the wine before we put it to our lips, the glass to our lips. And our brain can’t help but kind of predict or make expectations about the likely taste, aroma, flavor, bouquet of what’s to come. And so those expectations kind of anchor our experience when we do taste. In a way, it’s almost like we’re not actually tasting, we’re kind of occasionally comparing our experience to what we expected. And if what we taste isn’t so different from what we expected based on the color and any other cues, then we live in this world of our expectations and never quite update enough for the actual experience that we have. 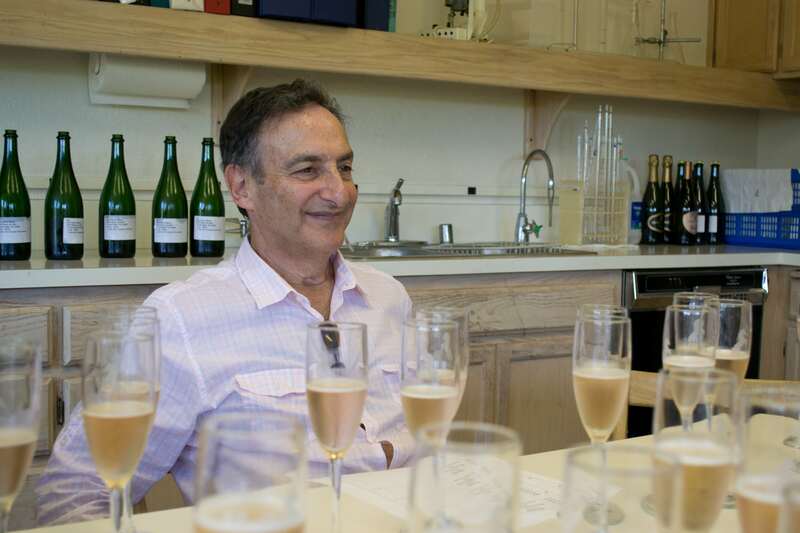 IRA FLATOW: I want to invite our listeners to ask if they have any questions about wine. Our number, if you’d like to the phone us in, would be– get the paper– we’re on 844-724-8255– as if I should know it by now, right? 844-724-8255 is our number. This idea of the color, the taste, whatever, do we have an evolutionary reason for some of those cues? CHARLES SPENCE: I guess it’s sort of yes, in the sense that what kind of world would we be in if we had to put everything to our lips to taste it in order to know whether it was nutritious or poisonous or not? So our brains kind of learned to make predictions and say, OK, I’ve learned that when I see a ripe, red, fruit color, it’s probably going to be sweet. When I see something that’s green, probably it’s unripe or maybe sour, less nutritious. If I can make those predictions, then I’m in a better place to know which trees to climb for the nutritious fruits, and what else to eat. So we’re always trying to make these predictions, what correlates with nutritional qualities in food and drink, and use those predictions in order to kind of second guess or anticipate what we should consume. IRA FLATOW: One of those relations you’ve done, experiments, you’ve gotten people to drink wine under different colored lighting. Did that really make a difference? CHARLES SPENCE: It really did so, I think in what might be the world’s biggest experiential, experimental wine tasting, where about 3,000, a little over 3,000 people in the Southbank Centre, under the Southbank Centre in London, back in this May bank holiday of 2014, and we gave them all a glass of red wine, a rioja, in a black tasting glass, so you couldn’t see the color. And then we asked the people to rate the wine, saying how fruity or fresh, how much they liked it, initially under just regular white lighting you might have at home. And then we changed the lighting to red, then we changed it to green, each time asking people what it tastes like now, and then added in some music into the background, as well, sweet and sour music. And we were able to show with those 3,000 kind of regular drinkers, not wine experts or such, we get about a 15% to 20% change in people’s perception of the fruitiness or freshness of the wine, or how much they liked it, simply as a function of the background illumination in the room in which they were tasting. CHARLES SPENCE: They really should know it. IRA FLATOW: –lighting and music. CHARLES SPENCE: And there is a certain sense in which intuitively, sometimes designers, experienced designers may pick up on these things and incorporate them, not necessarily knowing why, or sometimes feeling a bit kind of embarrassed that– why should the room lighting change the taste of what people order? Why should the music playing in the background change what people say? Music does. But it’s kind of our job in a way to test those intuitions, provide evidence for those that really do matter, and some other things that we think should matter actually turn out not to. And it’s kind of bizarre, in a way, that those background colors do make a difference. But I guess in that sort of tasting environment with a black tasting glass, if all you got is the red lighting, that primes all sorts of notions for us about sweetness, and that again anchors because the tasting experience. And when we had the wine makers who came to the color lab, this event, they were the kind of real experts, and they would not be affected by the background color. They can just identify what is in the glass and the taste and the bouquet, and yet they were coming away saying, wow, we know about this, and we need to change our cellar door experience, in order to deliver a different kind of experience for those who come to our wineries. IRA FLATOW: Interesting caller. Let’s go to Denise in Tulsa, Oklahoma. Hi, Denise. DENISE: Hi, there. I have a question, and I’ll admit I did step away from my radio for a moment, so you may have covered this. But I am blind, and I wondered what effect that has on my perception of taste. Am I just missing a spectrum of taste, or do I maybe taste things more accurately without that visual preconceived notion? CHARLES SPENCE: I suppose it depends, in a way, on when– whether you were born blind, congenitally blind, or became blind later in life. IRA FLATOW: And what would that difference be? CHARLES SPENCE: So those who have never seen may not have the kind of visual imagery that those who, say, become blind later in life– for a number of years after people become blind, they can still imagine what things look like, what their partners look like. And there can be that mental imagery that does much of the work, much in the same way, I suppose, that you see really with these dine in the dark restaurants that are attempting in some cases to try and capture the experience of the blind. If you lose sight, does not mean that your other senses are more acute, you tend more to taste and smell? Perhaps. But again, it sort depends on how long from when the vision is lost. Even those of us who go to a dine in the dark restaurant, say, and try a glass of wine that we cannot see nevertheless, our mind might be making images of what we think that wine, from its temperature, from its bouquet, what I think it looks like. IRA FLATOW: Let’s talk about– now that we’ve talked about vision, what about sound? You’ve done experiments in how sound affects the wine drinking experience. And we have two clips here of two different sparkling wines. Let’s hear the first one. I’m getting thirsty just hearing that. And the next one. Boy, they were different. They really were different. What makes them different, Charles? CHARLES SPENCE: So I think sound is often talked about as the forgotten flavor sense. We think about what things taste like and what they smell like, maybe even the sight of them, in the case of the white and red wine. But the sound of things, that’s something we never really think about. And the other thing, it’s key to our experience of flavor. And again, even when somebody pours something in front of us, from the sound the pouring we can tell so much about what’s in the glass. We can tell perhaps the temperature, is something hot or cold? They sound different. We can even tell the kind of carbonation. This is something that you find wine writers intuitively talking about. They say they love the sound of the bubbles in a fancy champagne. They’re just not the same in a cavo or in a soda water. And my research online with sounds, just like the ones you played, demonstrate that we really can tell the difference between different kinds of carbonation. We have an appreciation, a preference for– I think mine was the second one, rather than the first. It felt sort of creamier, somehow. IRA FLATOW: Yeah, well, the first one was a flute glass, and the second one was a wider glass. And I guess it matters how the bubbles get distributed and the sound bounces around, too. CHARLES SPENCE: And different kinds of carbonation, too. So I think from the sounds of pouring, as we heard, you can tell something about a temperature. You can tell something about perhaps the glass size. You can tell something about the kind of drink that’s been poured in, maybe even the viscosity. All that information is there. We never really think about it, because normally we can see the wine, and yet our brain picks up on these cues, and they too can subtly change our expectations. IRA FLATOW: I’m Ira Flatow. This is Science Friday from PRI, Public Radio International, talking with Dr. Charles Spence of Oxford. Let’s talk about the cap. You know, when you bring a bottle of wine and you unscrew the cap rather than pop the cork, aren’t you already at a disadvantage, just from seeing that happen? CHARLES SPENCE: From seeing that happen, or from hearing that happen? Because there’s distinctively different sounds of the pop of the cork and the crack of the screw cap. And this is something that does set expectations, too. And once you’ve heard those sounds or you’ve seen what kind of bottle closure was used, you cannot unsee it or unhear it, and that will set expectations. If I give you a completely blind taste test, the chances are the majority of consumers, just social drinkers or even wine experts, would prefer, if anything, the screw top. And yet when we hear the closure, when we see the closure being opened, we all have a preference, many of us have a preference for the cork stopper bottle. IRA FLATOW: What about the bottle itself, the size, the shape, the color? Does that influence what we think about the wine? CHARLES SPENCE: Most certainly it does. The one thing we’ve been most interested in over the last couple of years is again following up on some of the comments you find in the wine press about some of these new world producers who are delivering their wines, mostly all of the 750 mLs, but in bottles that are so heavy that in fact, sometimes you find wine waiters now in restaurants coming, when you picked a wine from a list, they’ll bring the bottle to the table and say, feel that, sir, just feel the quality. You made a good choice tonight. And that’s about the weight of the bottle. And when we’ve tested, evaluated the 600 or 700 bottles in the Oxford wine store just down the road from where I am tonight, what you find is that for every extra pound you pay, you get eight extra grams of glass, and that now we find there are some producers out there who are making bottles that are maybe 2 and 1/4 kilograms of glass when the wine is emptied, compared to others where it’s just less than a kilo full of wine. So a huge difference there, and some are accentuating, almost caricaturing the weight by deepening the pump, by thickening the glass, by raising the shoulders, in order to convey a notion of quality. IRA FLATOW: Can you take a fairly bad quality wine and make people think it’s a good quality, by how you bottle it in glass? CHARLES SPENCE: That is the question, isn’t it? When you come around to my house, what should you bring? CHARLES SPENCE: I think there are limits, certainly here, and some of the latest neuroscience and neuroimaging research, when you look at which parts of the brain light up when experts and social drink are given wine that you tell them it’s expensive or cheap, it turns out there are limits, and that it may be that mid-price wines can be shifted all over the place. But what do you call it, Two Buck Chuck, you might have a bigger challenge, just by putting in a heavy bottle. You might convince some, but I think not all. IRA FLATOW: I think we’ll leave it right there, Dr. Spence. Charles Spence, Professor of Experimental Psychology, University of Oxford in the UK, and head of the Crossmodal Research Laboratory there. Very interesting. Thank you for taking time to be you with us today. IRA FLATOW: And also thanks to Jamie Goode, author of the book, I Taste Red. And check it out if you’re a wine and science geek. It helped us with a lot of our research.